BBRZ had been invited to organize a method table there and to prepare a workshop. 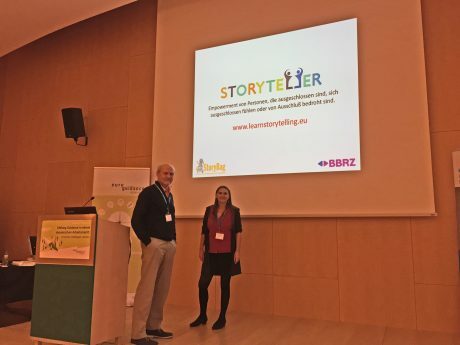 Ingrid Pammer of BBRZ and Peter Frühmann from Storybag (Netherlands) joined forces and facilitated the workshop around storytelling, based on our project’s methodological background and narrative techniques. We were content that our method table and the topic of ’storytelling’ drew the attention of the conference participants, and prior to the meeting we had already heard that our workshop was ‘fully booked’. We presented our State of The Art Compendium, the final Guidelines (draft) and the latest newsletter. 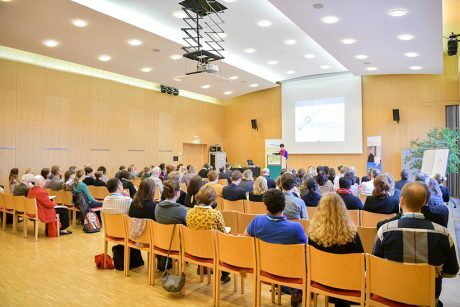 In the morning of the conference we could follow the presentations of two interesting keynote speakers, and when we listened to the content of their speeches we already saw overlaps and chances for our future course curriculum. Alison Crabb, Head of Unit “Skills and Qualifications” of Employment, Social Affairs and Inclusion of the European Commission talked about the rapidly changing labour market and the associated numerous transitions. 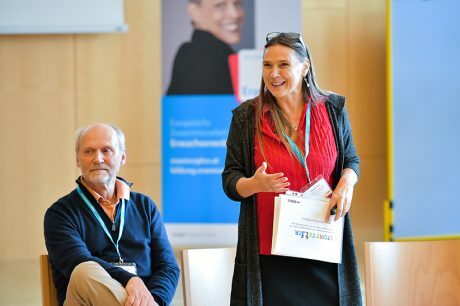 She lifted the veil on the most current strategy development within Europe, among it the “Upskilling Pathways”-strategy and the “European Pillar of Social Rights”. 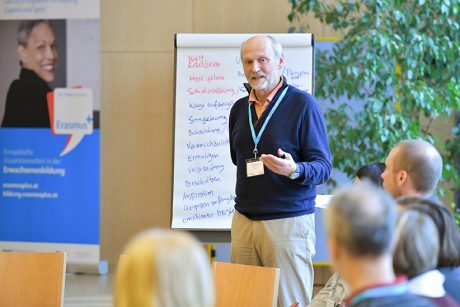 Following her, Andreas Hirschi, professor of Industrial- and Organisational Psychology at the University of Bern – provided us with a view to the latest approaches in sustainable career development that refer to the fast changes on the labour market. Job counselling that takes these circumstances into account (and does not limit itself to ‘matching’, finding a suitable workplace training offer, etc.) should focus more on the acquisition and sustainability of employability, make resources (e.g. social networks) visible and activate them, and include motivational components. Overall, it should strengthen the ability to deal with change and promote adaptability. By that, counselling and guiding can contribute to a holistic and sustainable career development. When we look at the content of the above keynotes, we can conclude that narrative practices can be an additional sustainable and probably successful approach. The participants in our workshop were counsellors for different labour market (risk) groups: fugitives, immigrants, burn out, long time unemployed etc. We were happy that Alison Crabb from the European Commission also participated. Prior to the workshop she already had mentioned her interest in what working with stories can do. StoryTeller project (we already had given an overview at the method table: the State of The Art Compendium, the final Guidelines draft, and the latest newsletter. After that the methodological background was presented. We had decided to pick some cherries from the course curriculum knowing that we just can give a short glance at what the results of “working with stories” could be. So we started with the proven icebreaker: the Portrait Circle. We continued in a plenary session about the functions, the benefits and dangers of stories, the intentional aspect of telling, and the difference between storytelling and narrative. The last was also an opportunity to introduce dominant narratives and discourses (stories can be prisons…). A short video of professional storyteller Ben Haggarty concluded all the above. After a short break we moved to the first experience part: an interview. It was preceded by a short ‘hearing and listening’ activity and an explanation of ‘story eliciting and facilitating questions’ (and the power of questions), which were something completely new to some participants. We did a ‘mentor story’- activity, providing story eliciting and facilitating questions. In the plenary conversation afterwards, this already was revelation for the group, despite familiarity with interviews. We also discussed the ‘obstacle’ of emphasizing ‘the trauma’ (which can become a repetitive, ‘studied’ story), instead of starting with positive moments (less straining and less threatening) in people’s lives and gradually move to the ‘real problem’. 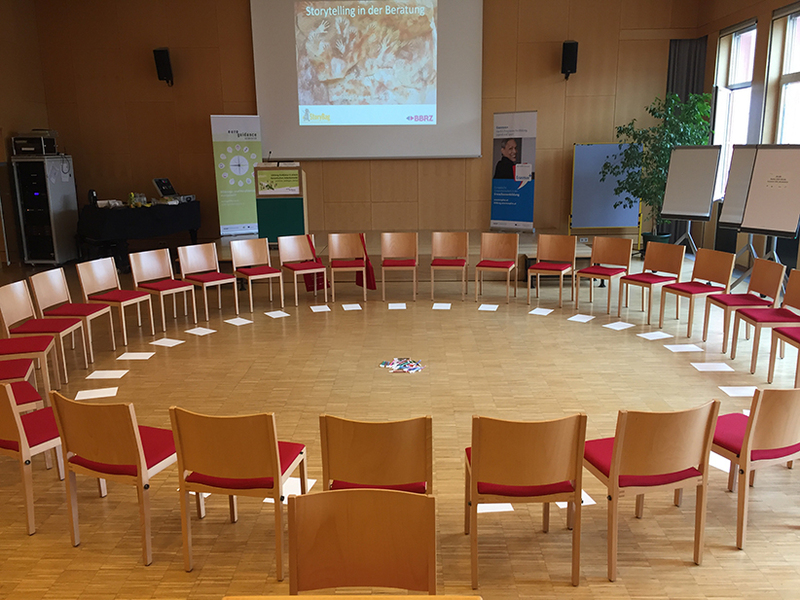 The second part was an introduction to story circles, how to prepare them (based on theme, topic, issue) and ways to invite participants, guarantee their ‘safety’ (e.g. anonymity) and be transparent about the objectives and outcomes. Again the importance of questioning and facilitating was emphasized, and how to deal with dominance and/or opinions. We proposed a theme/question for this session: “Can you recall a time/a moment when you perceived a major positive change/transformation in (and for) a client?”. Facilitating / eliciting questions were e.g. : “What happened?”, “How did it start?”’ “What changed?”, What were your (and the clients) insights”. Given the limited time frame of the workshop, we could only ask for the experience (positive!) and not so much if patterns had been found. After the workshops a final plenary activity of all conference visitors had been planned. Working in groups of different workshop participants, the experiences and insights were shared. We are looking back at an interesting, inspiring and well-organized conference.